00:04 rubenwardy "Report: i need a boyfriend anyone (no mods online)"
00:07 rubenwardy It's almost certainly a 10 y.o. 00:08 Hijiri is it rotation per axis? 00:09 Hijiri or is it a direction? 00:18 Lugal how can I make an fireball shot by an NPC do damage to monsters? 00:26 DoyleChris i am trying to make a coal brick to use for some recipes and was wondering if i need a model for it. 01:48 DoyleChris but all im getting is a colored block where the image should be. 01:53 RealBadAngel and the code for it? 01:55 RealBadAngel do you have texture stored in /textures ? 02:14 lambda-11235 Can I grow cotton underground? 08:12 netspl0it When was Oldcoder last active? 08:15 OldCoder What do you need? 08:17 netspl0it Wanted to get in contact with you, I am Dafull97 if you remember him? It has been about a year since we have talked? 08:18 OldCoder Why the current nick? 10:19 twoelk organize like clean up? - I gotta run - where can I hide? 11:22 Megaf Hi all, is Wayward One here? 16:47 Glorfindel what should the settings be changed to so I can get the max possible? 16:55 OhSalad Hey there, I could use a bit of help. 16:55 OhSalad So I made the GUI too large by accident. 16:56 OhSalad I can't see that slider. 16:57 Glorfindel one of the lines will be "gui_scaling = 1.04"
16:57 OhSalad What's the stock value of it? 16:58 OhSalad Fixed, thanks a ton amigo. 17:00 OhSalad Is there any way I can change sensitivity though? 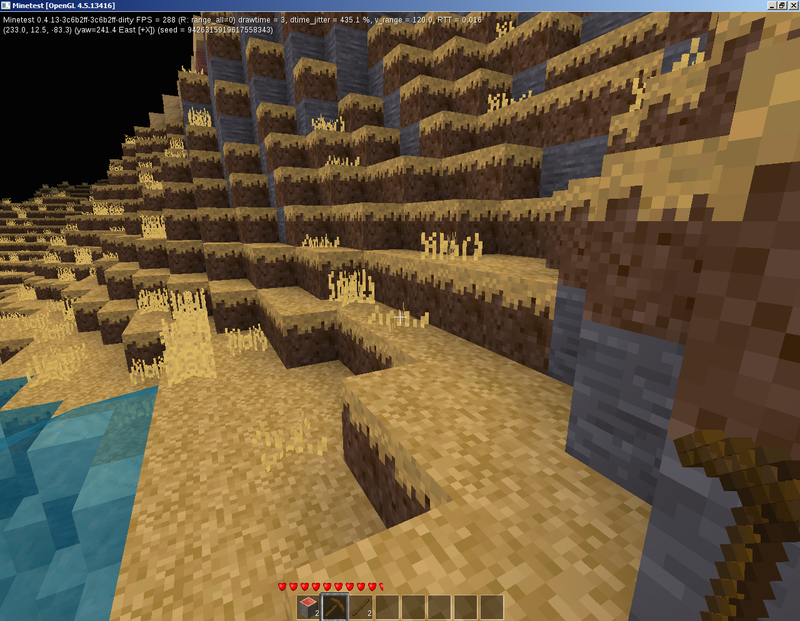 17:01 OhSalad This tiny FOSS project, built by a handful of people is already better optimized then actual minecraft. 17:02 OhSalad Back when I played it it ran like garbage. 17:03 OhSalad No, I played it in beta. 17:07 Calinou yeah, even the Realms thing says "As you probably know, we're owned by Microsoft"
17:10 Glorfindel Calinou: you know what I should have the settings at to get the best performance out of minetest? 17:14 Fixer pirate MC launcher - 145 kbyte ._. not sure about 300 mb, that was sarcasm? 17:17 est31 Fixer, have you local map saving enabled? 17:18 Calinou Fixer, I don't care, I have 8 GB. 17:23 Glorfindel would disabling local_map_save help a lot? 17:23 Fixer help with what? 17:24 Fixer Glorfindel, you like to save your builds? 17:26 Obani OhSalad, Are you on a server ? 17:37 lambda-11235 For the areas mod, with area_pos I only have to select the two corners on the ground, right? 17:38 lambda-11235 It isn't a 3D rectangle selection is it? 17:39 Cidraque what's the differences? what should I use? 18:36 sfan5 why aren't the rivers made of ice in snow biomes? 18:38 LazyJ The valley's mapgen that has been added to the engine, does it contain all the different trees, floral, and soil types that the Lua version does? 18:41 LazyJ Will the Lua version nodes be added to the default? 18:42 LazyJ And, since Valleys is based on mapgen v7, will development shift away from mapgen v7 to Valleys? 18:43 LazyJ My questions and concerns center around using the new default Valleys mapgen for a long-term world. 18:45 LazyJ Which of the mapgens is slated to succeed mapgen v6 as the default? 18:46 LazyJ Too early to tell. 18:48 LazyJ There have been other, built-in mapgens in the past that were removed. In the case of mapgen v5, it was brought back. Will this happen to Valleys? 18:49 LazyJ Game-play-wise... that depends entirely on the type of game played. 18:50 LazyJ Hehehe... yeah. I don't see much practical game-play use for the fractal mapgen but if experiments with it help improve the other mapgen options, then it has good purpose. 18:51 LazyJ "Singlenode" is set to "false" by default, but I actually use singlenode worlds for clean-up so I enable it before compiling Minetest. 18:53 LazyJ So, if I have a useful purpose for an empty mapgen like singlenode, someone else probably makes good use of the fractal. 18:55 LazyJ Do you see the Valleys mapgen as still heavily under development or is it mature enough to where any foreseeable future changes would be very minor? 18:55 LazyJ And to clarify, I'm referring to the built-in version, not the Lua version. 18:57 lambda-11235 For the areas mod, with area_pos I only have to select the two corners on the ground, or do I have to have one corner in the air? 18:58 LazyJ lambda-11235, you have to have two opposing corners, so yes, one in the air. 18:59 LazyJ Sokomine's "Markers" mod is a GUI for Areas. 19:00 LazyJ Place one pole in each of the two, opposite, cubical corners and punch the last pole to get the menu for setting owner, area name, and adjusting the elevation of the protection. 19:02 LazyJ The Markers mod has a pre-set limit on height, width, and depth. (50x100x50, iirc). 19:02 LazyJ The limit is enough for most typical builds in Minetest. 19:04 LazyJ I use both, the commands for Areas and the Land Title Register book from Markers, to manage protection settings on the server. 19:05 LazyJ The one thing I wish Areas would do that the Protector mods does is show a grid of the protected area. 19:08 LazyJ Taking it a few step further, a temporary grid (like the Protector mod and WorldEdit use) and a toggled on/off grid, and something that would show in the minimap. Another enhancement would be a display of different colored grids for all protected areas to help identify overlaps and pockets. 19:08 LazyJ And with that I'll stop this wall o'text. 19:21 lambda-11235 LazyJ: Thanks, just finished protecting my areas. 20:02 Nocx So for MODS do I use #minetest or #minetest-dev ? 20:05 Nocx end --> crash: "bad argument to 'pairs' (value expected)"
20:06 sofar it's not a pair? 20:06 sofar just a single object? 20:15 sofar what is FishValues actually? 20:32 kaadmy does anybody know what causes the bad wieldhand mesh yet? 23:03 sofar is there a wordedit command to manually set pos1 with coords? 23:07 sofar sfan5: not possible? 23:31 BBmine oops i meant to quit. how to?